Diesel-powered vehicles may give a negative impression related to air pollution such as photochemical smog since they discharge large amount of pollutants. On the other hands, diesel vehicles have become popular for commercial cars because of acceleration response by strong torque and good economic efficiency by fuel-saving performance. While reinforcement of emission regulations spread worldwide, the technology that has been developed for coexistence of natural environment and diesel vehicles is a Urea-SCR system, which currently attracts attention in the market. SUN-A’s urea quality sensor monitor the urea water in the exhaust after-treatment processing system and play the role to properly function the system. The Urea-SCR system is an exhaust after-treatment technology to cut NOx pollutants from exhaust emissions by using urea aqueous solution. The system takes advantage of the principle that converts the nitrogen oxides(NOx) in exhaust emissions back into harmless nitrogen and oxygen molecules by chemical reaction with ammonia(NH3). SCR stands for Selective Catalytic Reduction. The Urea-SCR system was first brought into practice in Japan and employed to deal with diesel engine trucks in anticipation of Japan’s 2005 new long-term emission regulations. Since then, Urea-SCR technology has been globally developed and began to be integrated into the heavy-duty diesel engines along with the introduction of regulations worldwide. 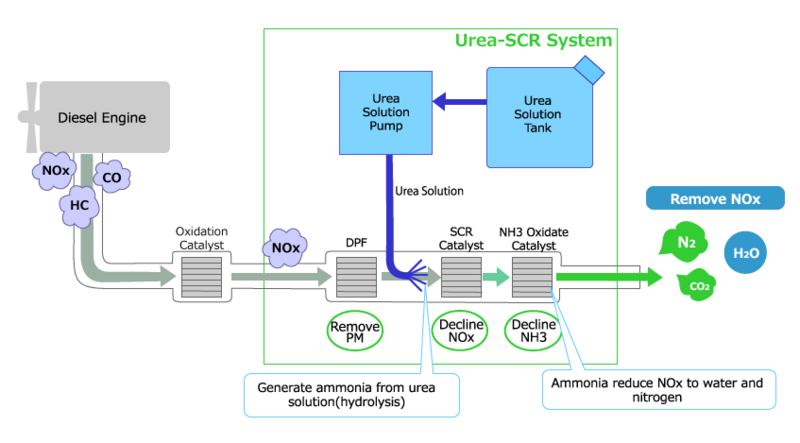 Nowadays the Urea-SCR has been characterized as the mainstream technology for exhaust after-treatment processing system for heavy-duty vehicles. SUN-A’s urea quality sensor is mounted into an urea water tank in the Urea-SCR system. Since the urea water must be appropriate for the onboard diagnostic systems to properly reduce nitrogen oxides, urea quality sensor monitor the concentration of urea water in the tank. Moreover, SUN-A’s urea quality sensor plays an important role in the Urea-SCR system as a consequence of ability to detect misfiling with consumable substances other than urea water, to measure temperature for detecting freezing and dissolution, and to find whether or not the tank is empty. Japanese emission regulation has started in 1966 and become stringent year by year. In 2005, exhaust emission test method was reconsidered for both gasoline and diesel vehicles and “new long-term emission regulation” was introduced. Three years later, the exhaust gas regulation (the post new long-term emission regulation) of world’s most stringent level at that time was introduced. Still in 2010, the emission standard was reinforced for particular diesel-powered vehicles to reduce pollutants. In EU member countries, after the emission regulation “Euro 1″ was first introduced in 1993, the emission regulation value become made more strict. The latest standard “Euro 6″ apply a limit of emission of nitrogen oxides (NOx) to be 0.13 g/kWh on average, and all newly sold vehicles in EU have to pass the regulation value since 2015. Emerging countries such as China and India tend to follow the regulatory level of the euro zone. Meanwhile, the emission regulation is enforced at the federation level by Environmental Protection Agency(EPA) in the United States. The current regulation EPA2010 limits nitrogen oxides(NOx) of diesel vehicle emission to 0.27g/kWh, and even more stringent standard is scheduled for enforcement in 2017. In order to pass those strict regulations, automobile manufacturers globally have faced with the need to equip and continue to operate an exhaust after-treatment processing system such as the Urea-SCR for diesel-powered vehicles.